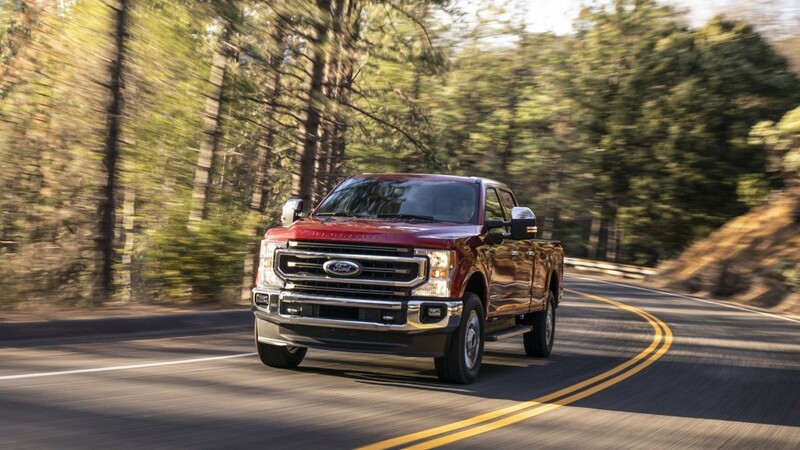 New F-Series SuperDuty improvements include new gas and diesel engines, an all-new 10-speed automatic transmission, chassis upgrades,exterior and interior design updates, and smart advanced technology that raises the bar again in towing, payload and connectivity. "Super Duty customers have demanding and diverse needs-from towing heavy trailers to repairing critical infrastructure," said Kumar Galhotra, Ford president, North America. "Productivity is their lifeblood and their truck is their biggest tool. Our new Super Duty has more power, more payload and towing capability and better technology than ever to help these customers build a better world." F-Series Super Duty had the most market share in industries such as government with more than 60 percent share, petroleum with 50 percent share and utility services with more than 45 percent share, according to Ford analysis of IHS Markit TIPNet registration data, January 2017 through November 2018. Ford is making its all-new 10-speed TorqShift automatic transmission available across all three Super Duty engine offerings for the new 2020 model. An all-new Ford-designed and Ford-built 7.3-liter V8 joins the standard 6.2-liter V8 in Super Duty's gas engine stable. TheFord-designed and Ford-built third-generation 6.7-liter Power Stroke diesel V8 is upgraded to deliver more power and torque.An all-new Ford-designed and Ford-built 10-speed heavy-duty TorqShift automatic transmission is paired with the 7.3-liter V8 and third-generation 6.7-liter Power Stroke diesel V8. Ford is the only manufacturer to design and build all of its heavy-duty engine and transmission combinations -ensuring the powertrain works seamlessly with all chassis components and vehicle calibrations. "With the addition of the 7.3-liter V8, upgrades to our 6.7-liter and the debut of an all-new 10 speed transmission, we are delivering the strongest, most capable Super Duty power train offerings yet," said Mike Pruitt, Ford Super Duty chief engineer. The 7.3-liter gas V8 engine delivers high performance in a compact package. Based on decades of commercial engine experience, this 7.3-liter is expected to be the most powerful gas V8 in its class-providing durability, ease of maintenance, and the towing and payload capability customers want. It uses an all-new cam-in-block, overhead valve architecture with cast iron block and forged steel crankshaft for maximum durability. Port injection with variable-valve timing optimizes the intake and exhaust to match performance with workloads. Oil jets cool the pistons under heavy loads. Super Duty's third-generation 6.7-liter Power Stroke includes a new 36,000-psi fuel injection system with all-new injectors that precisely meter and spray up to eight times per stroke to control noise levels and optimize combustion. This innovative inboard exhaust diesel V8 features a redesigned electronic-actuated variable-geometry turbocharger that provides improved pumping efficiency and throttle response. Structural enhancements increase the strength of the cylinder head, block, connecting rods and bearings to handle higher cylinder pressure and increased output. New steel pistons provide higher firing pressure capability and less friction-meaning improved performance and more horsepower and torque than ever. The truck's standard 6.2 liter gas V8 rounds out the three engine choices for Super Duty customers. This workhorse offers heavy-duty truck customers proven capability at an affordable price. This electronically controlled transmission has selectable drive modes that include normal, tow/haul, eco, slippery, and deep sand and snow. The entire unit is so cleverly engineered that-even with four extra gears-it fits in the same space as the 6-speed and weighs only 3.5 pounds more. Available lane-keeping alert helps you stay between the lines on the road, while the Blind Spot Information System with trailer coverage monitors for vehicles in your blind spots -even when towing. Because today's work is a 24/7 proposition, staying connected is essential. Every new 2020 Super Duty includes Ford Pass Connect embedded 4G LTE modem with Wi-Fi access for up to 10 devices, keeping crews in communication no matter where the job might take them. Available lane-keeping alert helps you stay between the lines on the road, while the Blind Spot Information System with trailer coverage monitors for vehicles in your blind spots -even when towing. Pre-Collision Assist with Automatic Emergency Braking aids in avoiding or mitigating collisions with other vehicles. These features are standard on XLT and above Super Duty models. Modern touches include the addition of wireless charging and USB-C ports to power your devices. Decorative appliqués on the doors and media bin door have been updated on Lariat, while on Platinum edition trucks, these pieces have been updated to Onyx Argento wood. Super Duty's LED headlamps have a new look with improved performance, while high series trucks feature continuous signature lighting. An improved front bumper and air dam optimize cooling and make using utility hooks easier. A freshened tailgate design, revised tail lamps and new rear bumper convey bolder Built Ford Tough style. Decorative appliqués on the doors and media bin door have been updated on Lariat, while on Platinum edition trucks, these pieces have been updated to Onyx Argento wood. The interior of the Limited model is completely refreshed, with colors updated to Ebony and Highland Tan to provide a refined, modern feel. Limited features authentic materials like genuine leather, a coarse ash wood in black and modern brushed aluminum trim. Crafted details include decorative stitching on the leather-wrapped instrument panel topper, wrapped door armrests, seating and center console lid, and an embroidered Super Duty logo added to the floor mats. A soft headliner in Miko® suede is intended to give the cabin an expansive feel. Because the testing surfaces and durability test tracks are so punishing, many of the miles are run using robot drivers that can handle the abuse better than humans to ensure every F-Series truck is Built Ford Tough. The new F-Series Super Duty debuts as the most tested pickup in the company's history. It endured more than 12 million miles of testing for the 2017 model year, which was increased by an additional 7million miles for 2020 to ensure the new Super duty can stand up to the rigors the most exacting truck customers demand of it. This torture includes running the truck around the clock under the most extreme loads and through all kinds of environmental conditions using dynos, test tracks and public roads. Because the testing surfaces and durability test tracks are so punishing, many of the miles are run using robot drivers that can handle the abuse better than humans to ensure every F-Series truck is Built Ford Tough. Ford's new 2020 F-Series Super Duty will start shipping to dealers this fall.